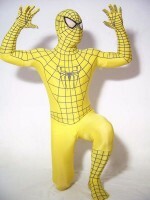 Yellow Spiderman Costume on sale. Stretchy,comfortable and cheap price. 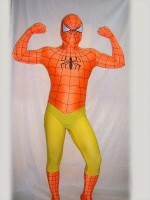 this Spiderman Costume with lycra spandex material adopted,the suit is Orange and Yellow colored.spider line are black.eyes are made with corespun can see out well.there has no spider on the back.zipper is on the back,from head to waist. Color: Red & Blue Pattern: Yes Fabric: Lycra/s..
A super hero costume with lycra spandex material adopted,the suit is Yellow colored.spider stripes are black.eyes are made with corespun ,zipper is on the back. 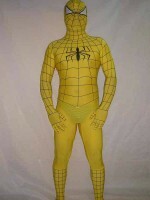 Color: Yellow & Black Pattern: Yes Fabric: Lycra/spandex Surface: Matte Eyes: corespun (can see out) Elasticity: Good..
Yellow full body spiderman costume suit outfit zentai with black stripes. this is the new style of spider-man 3 spiderman costume,both the front and the back has the spider. the line of the spider is contract inside at the waist. You could fill in your accurate measurement and we free c..